This spring, former Phillips curator Beth Turner taught an undergraduate practicum at the University of Virginia focusing on Jacob Lawrence’s Struggle series. In this multi-part blog series, responses from Turner’s students in reference to individual works from the series will be posted each week. Read the introductory post here. On March 5, 1770, an argument broke out between a colonist and two British guards outside of the Custom House in Boston. It escalated to a riot between Bostonians and the British guards, resulting in the deaths of five colonists. This incident was almost immediately immortalized in Paul Revere’s famous engraving The Bloody Massacre, which aimed to cement the brewing anti-British sentiment among the colonists with its inclusions of controversial and falsified details. 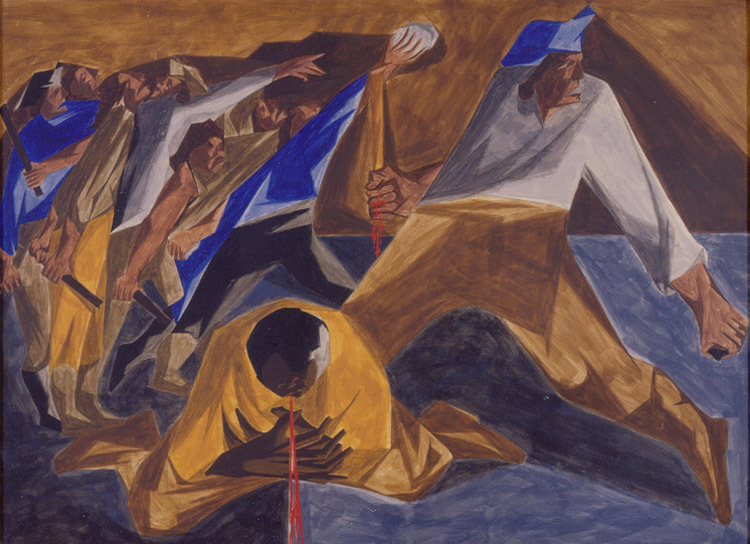 In stark contrast to Revere’s propagandist agenda, Jacob Lawrence’s interpretation Massacre in Boston focuses on the struggles of the American colonists by portraying them rallying around their wounded compatriot. There was not a single British soldier in the painting. Fast forward to 1955 when Lawrence worked on this panel, the year that African Americans rallied around the death of Emmett Till, a young African American boy murdered by two white men in Mississippi. The culprits were not convicted of homicide. Through the media attention the case garnered, it was transformed into the symbol of the disparities of justice and rights for African Americans. In both of these episodes in American history, the power of the people is emphasized. This aspect is conveyed in Lawrence’s work with his focus on groups of figures coming together, fighting for a common cause. This entry was posted in Exhibitions and tagged african american artists, African American history, American history, art history, Jacob Lawrence, The Boston Massacre, the struggle series. Bookmark the permalink.